عندما تزور هذه المدينة رائعة الجمال، ستشعر أنك في بيتك في كومفورت إن أون ماين الذي يقدم لك إقامة متميزة و خدمات عظيمة. إن موقعه الجيد الذي يبعد 0.5 km فقط عن مركز المدينة يساعد النزلاء على الاستمتاع بمعالم المدينة ونشاطاتها. يوفر الفندق بفضل موقعة الجيد وصولاً سهلاً إلى أهم معالم المدينة.
. إن كومفورت إن أون ماين حريص على توفير الراحة للنزلاء، فلا يوفر الموظفون جهداً في تقديم أفضل الخدمات وضمان حسن الاستقبال. يمكن لضيوف الفندق الاستمتاع بالميزات التالية على أرض الفندق: واي فاي مجاني في جميع الغرف, خدمة التنظيف يوميًا, واي فاي في المناطق العامة, موقف سيارات, غرفة عائلية. استمتع بوسائل الراحة الراقية في الغرف أثناء إقامتك هنا. بعض الغرف تتضمن خزانة, شاي مجاني, مناشف, قهوة فورية مجانية, تلفزيون بشاشة مسطحة لمساعدتك على استعادة طاقتك بعد يوم طويل. كما أن مجموعة الخدمات الواسعة الموجودة في الفندق لضمان راحتك تترك لك الكثير من الخيارات لقضاء وقتك أثناء فترة إقامتك. إن كومفورت إن أون ماين هو مكان مثالي للمسافرين الذين يتطلعون إلى الراحة والاستجمام في المدينة. يوما الإثنين والثلاثاء: من الساعة 07:30 صباحًا إلى الساعة 06:00 مساءً. من الأربعاء إلى الجمعة: من الساعة 07:30 صباحًا إلى الساعة 07:00 مساءً. يوما السبت والأحد: من الساعة 08:00 صباحًا إلى الساعة 07:00 مساءً. أيام العطلات الرسمية الأسترالية: من الساعة 08:00 صباحًا إلى الساعة 06:00 مساءً. يجب على النزلاء الذين سيصلون خارج الساعات المذكورة الاتصال بالعقار مباشرةً. Incredibly clean. Great facilities - a toaster in the room along with jug and fridge makes breakfast a self-catered for meal. Roomy queen room. Lovely pool. Walking distance to shopping centres. Over the road from great take away food businesses. 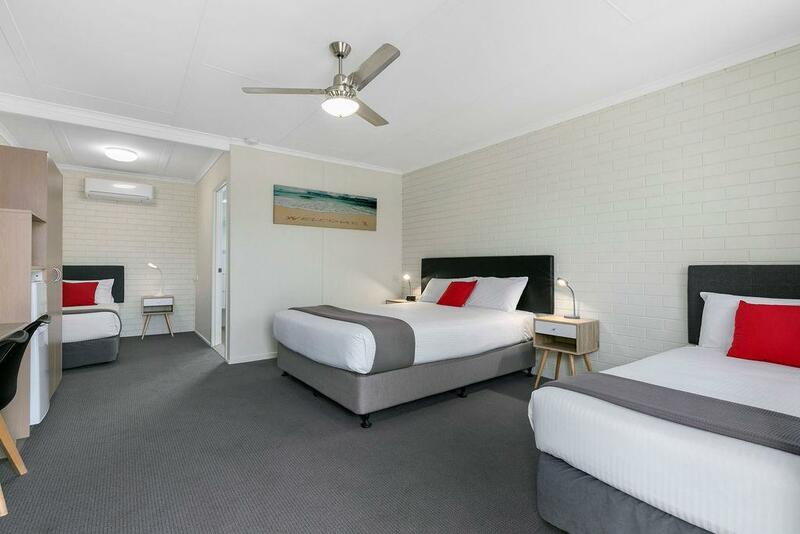 Best value for money motel that I've lucked upon in a long time. generally speaking, it was nice. Good location, clean,basic rooms with easy access to Pialba, close to shops. Restaurant not open Monday due to chef unavailable, no other suggestions given. Clean and tidy rooms but is only a basic 3 star hotel. Will stay again as a 1-2 night option. Value, room size and location. Stayed here overnight for $89. This was great value for money and the room and bathroom were quite large. Room was clean and well maintained. Air con was a bit loud but then many of them are. It's also in a good location near the main bus station and the main shops. Woild definitly stay again. 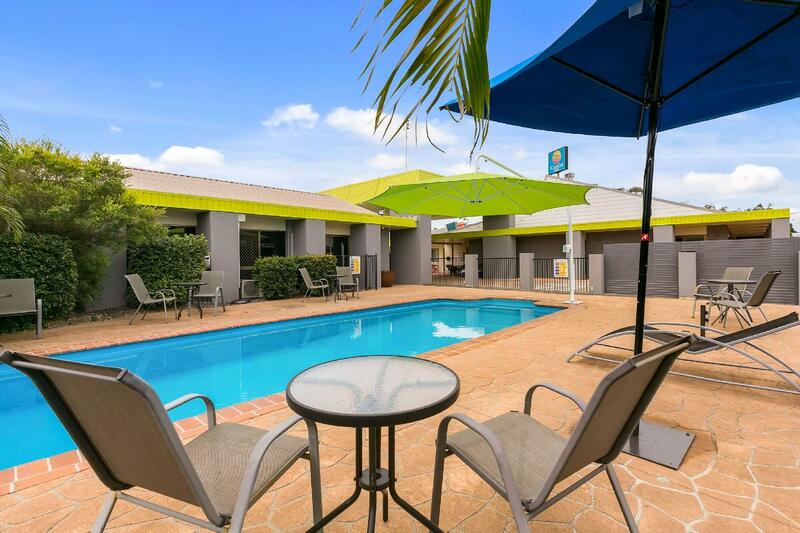 Well situated near shops, food outlets and library with free internet. It is more like a motel. The rooms are quite basic but reasonably big and clean. Austar is available on a reasonable sized TV. The owners are friendly and helpful. They can book tours for Fraser Island and whale watching with a pickup at the motel. There are supermarkets and plenty of food outlets nearby. The bus interchange and library with 15 minutes free internet are within short walking distance. reception was very friendly and helpful. it is in a nice quiet location that is close to shops and not far from all that hevery bay has to offer. parking is right outside the door of your room. basic amenities in your room, though it didn't have a sink. 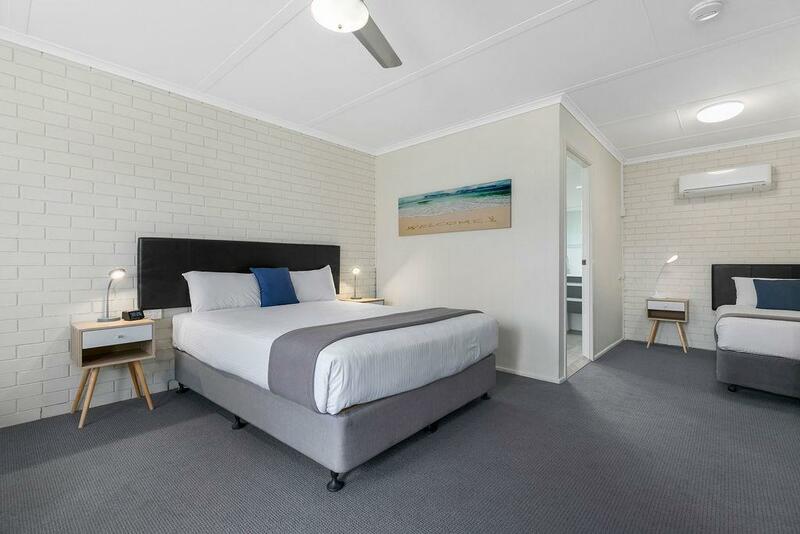 i would use again as a place to stay while visiting hervey bay tourist attractions. This is a typical American motel. Very clean and handy. The owners are lovely!! The bathroom wall was not water sealed, and after two adults and two young kids took a bath, the bedroom carpet was soaked wet with water from around the wall adjoining the bathroom. This ended up wetting even the ends of the bed covering which touched the floor- not a good experience. The lady manning the reception appeared uninterested, unsmiling and unfriendly, with a sign next to her warning visitors from starting any pointed discussions with her. But the worst part was that when we booked the accomodation online we had specifically put a note asking for a bed for our 5yo child and we were under the impression that the 'great deal' and our online payment had covered for it. Much to our surprise on checkout the lady at the reception said that our note had been overlooked and that we had to pay an extra for the child for the three days of our stay. Needless to say it left us with a bad taste in our mouths and our poor impression of the place. Das Hotel ist eher eine Notlösung, erwarten kann man nicht viel, aber für 1-2 Nächte ok.
Das Hotel ist als sehr freundliches, sauberes und mit grossen ausgestatteten Zimmern zu bezeichnen und lohnt sich damit auf einer Rundreise. Im Hotel haben wir selbst keine Verpflegung genossen, aber das Hotel bat uns hinsichtlich Restaurants im Umfeld sehr gut beraten. Die Zimmer waren sehr gross, die Betten ev. Etwas zu weich, aber dafür war alles sehr sauber. einfaches sauberes motel ohne schnick schnack. pool vorhanden - internet für happigen aufschlag.